What Are other's saying about this service? How do you Rank AMEs on your Internal ZIP code search? How to Publicize and Expand my AME Practice? How do I update my FlightPhysical.com default web page? How do I become an AME? I don't know much about web sites, where do I begin? What types of Doctors Become AMEs? How do I attract new pilots to my exisiting web site? What is a domain and why would I want one? I already have a website, how can FlightPhysical.com help me? Why do AME's need this? Why should I use your email account, I already have one? How do I add my own pictures to my web page? How do I add a second directory listing? I'm a physician interested in aviation, how do I become an AME? Who is the website founder? I am interested, take me to the sign up page. What is an Internet Directory? Don't I already have an Internet Listing? What is the relationship between FlightPhysical.com and the FAA? What are the computer system requirements for using FlightPhysical.com? How will Pilots use this website? Why do you have "www" in front of FlightPhysical.com sometimes? Can I use an alternate practice location or delegate exams to an assistant? How do I buy or sell used exam equipment from other AMEs? My Map doesn't show my location correctly, how can I fix it? How will FlightPhysical.com change in the future? Why are you doing this, how will you fund the project? Occasionally I can't connect to FlightPhysical.com, is this a host / server problem? Why should we set up the online payment stuff? Should I let FlightPhysical.com register or transfer a domain name for me? How do you promote this to pilots? This is a difficult proposition. No matter how much $$ you spend on your web site, it does no good if no one finds it! We solve the publicity problem for you. If you go to a typical search engine such as Google.com and enter search terms like "flight" and "physical" you will get up to a million relevant returns. We are consistently number one or two on the output list and depending on the search terms you use, this search engine output usually numbers in the hundreds of thousands of "query results". Assuming an individual AME site even gets listed, it is rarely in the top 100 of the search results, so it is doubtful that it will be noticed by the pilot. To illustrate this problem and our solution, A Google search on 20 Nov 2006 yielded 28,999,000 relevant sites, and FlightPhysical.com site was number one on the output list! Ranking on this list changes daily, but we are always at or near the top because output order is based on Internet-wide popularity. FlightPhysical.com's traffic has grown exponentially over its first 4 years and our listing serves thousands daily and generates more "hits" than any single AME trying to promote his/her site. From 1999-2006, we have gradually climbed to the top of all Internet search engines. Collective sites rank highly and should be used to funnel traffic to your home site. You will increase your site's page rank in search engines when you have popular sites (like FlightPhysical.com) maintain inbound links to your web address. Take advantage of our popularity by linking from our site to your existing one for only $2 per month. Many practices already have external websites, but if you don't have one yourself, you know that you have a free internal site with us! We believe the sooner you establish an Internet presence, the better. Hosting services and e-commerce companies charge anywhere from $25 a month to $3000 for full website development and maintenance. Sometimes, Internet service providers (ISPs) will offer some free space to you on a subdirectory (e.g. http://www.someoneelse/theirdomain/subfolder/yourspace.com). These are all great hosting options, but they are not targeted to a pilot audience. This means it can be difficult for pilots to find your site. Fortunately, your existing or future external site is easily integrated (linked) with our site. Whether we link or host your site, use us to drive pilot traffic to you. We have had over two million page views since inception and currently serve pages to about 3000 visitors per day. Our site represents 4500 AMEs, and we have a full time staff working on publicity. We attract one audience -- pilots needing physicals, and we channel thousands of pilots to AMEs through FlightPhysical.com. If you have a fully capable website, place a link from a FlightPhysical.com profile page to your own site. We no longer require a return link as a courtesy, but we do charge $2 per month for outbound links if you are an otherwise non-paying AME customer. If you subscribe to any of our paid services, the outbound link fee is waived. See our fee schedule for more info on upgrade options. We can help you use your Internet to increase the efficiency of your practice. Our enhancements expedite pilot visits and improve their overall satisfaction with your service. The FAA and pilots recognize the potential power of the Web--don't be left scrambling. Oklahoma City is aggressively employing and refining the latest technology to bring clinical data into its central databases, but the overall business end remains the AME's responsibility. The FAA intentionally stands clear and allows us to run our practices as commercial businesses. FlightPhysical.com aims to help with the annoying but necessary logistic aspects of your practice. We offer services that you in turn pass on to your pilots. Scheduling and locating AMEs is one of pilots' biggest grievances. Our top-ranked national database puts your practice's web page just a mouse click away. Additionally, my office staff (and probably yours) is required to pass out repetitive information all day long. Giving verbal directions 20 times a day gets old. This telephone tedium is not a highlight of their jobs! All of this can be automated. 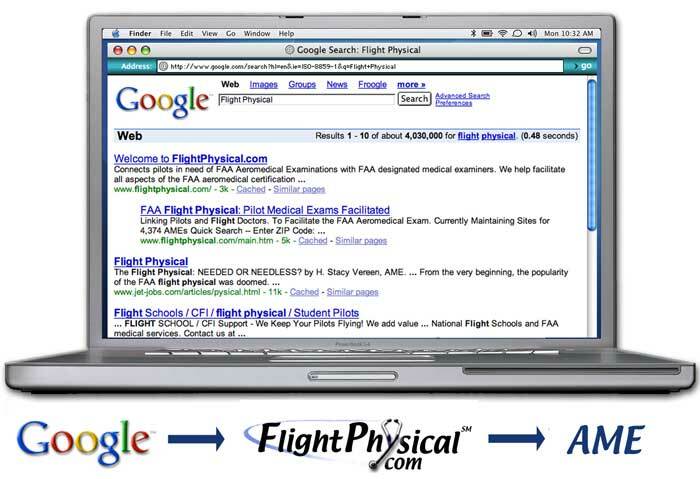 Using the Internet to post information and expedite the administrative aspects of doing FAA physicals makes sense. Pilots can load routine demographic information before they even arrive at your office. They can print out maps or driving directions to your office. This cuts total office time and benefits all parties. Pilots hate playing phone tag and waiting on hold as much as your staff dislikes making them wait. Pilots reduce total office time by scheduling and paying online. Soon, pilots will be able to complete the majority of the Flight Physical transaction on-line before they even arrive at your office! As flight doctors we are especially well suited to accepting on-line reimbursement because pilots seldom force us to deal with third party insurance payers. Start today by viewing or modifying your default web site. You can catch up quickly with your on-line colleagues. I already have a website, how can you help me? What made you think of this? From John Ogle, CEO: I am a pilot as well as an AME and I understand the aeromedical certification process well--from both ends. I created this website because I dislike playing telephone tag and sitting on hold and as much as anyone. I actually thought of this while on hold trying to get through to another physician! The FAA exam itself is great, as a flight doctor I've performed hundreds of flight physicals (maybe thousands? )...as a pilot, I've had about a dozen myself. Overall, I admire the exam process. It is highly evolved, and I certainly applaud the FAA for recent efforts to expedite data transfer to Oklahoma City via the Internet version of AMCS. Now the business end of the process can become equally efficient. I don't know much about web sites, but I want one, where do I begin? Most people underestimate the complexity of maintaining and designing a web site, but the AMEs, pilots and computer experts at FlightPhysical.com have years of experience. We can help you each step of the way, so that you will establish a strong Internet presence. This will be useful to your patients and pilots, and the professional web sites that we help create will be fully scalable and upgradeable. It is best to visualize the entire process in 4 independent parts: registration, design, hosting and publicizing. Register the domain name, ie www.YourPractice.com. At $15 per year, this is the cheapest step but the most time critical since the best names go fast and new ones get registered at about 40,000 per day. To allow for maximal future flexibility, you should not use a restrictive registrar such as Verisign. Please allow us to register your domains, or use a more liberal registrar such as Directnic. We charge no mark-up for this service, and it will facilitate future domain handling. Design the pages. This entails both graphics design and HTML design (page layout). Some AMEs use animations, complex media and "Flash" movies. Often these 2 sub-parts of graphics and HTML are done by different companies, but you could do it all yourself. There are infinite "how-to" tutorials on the web. Huge variability exists in cost and quality. At the cheapest end, you can do nothing and let your domain point to the template driven default page that FlightPhysical.com made for you (several AMEs are in the wait-and-see mode and are doing this). We also permit AMEs to add simple text headlines and compressed pictures to their default sites for free. With this option, you can and should still make some web page adjustments. These changes are best communicated to us through the familiar AME Modification form. At the extravagant end of the spectrum, some doctors hire professional site designers for tens of thousands of dollars up front and hundreds per month in maintenance fees. Often your practice partnership or HMO will cover these costs. A middle of the road option is to invest in software and training and learn how to use HTML generation applications such as Adobe GoLive or Macromedia Flash or Dreamweaver, then you can do it yourself. A slightly less expensive, but less reliable technique is to design with the more familiar MS Word or Powerpoint then save as HTML. Quality will suffer, but for straight text and graphics, you might be OK. Insure that the web pages look acceptable across different platforms and Operating Systems (Unix, IBM, Mac), and the appearance should be consistent across browsers (Netscape, Internet Explorer, Opera, etc). Graphics are often the biggest problem for do-it-yourself AME sites. Insure picture files are well-compressed and processed for the web. They must be optimized for the 72 DPI resolution of computer monitors, not 300 DPI used for printers or other media. Excess resolution imparts a tremendous file size penalty and degrades the web viewing experience (slow loads and poor quality Browser display). A digital picture file can be adjusted to an appropriate size with good compression and software enhancement via Applications like Adobe Photoshop or commercial services. Remember there is always a trade-off between quality (file size) and download speed. FlightPhysical.com offers professional graphic optimization as an additional service ($10) if you don't have access to Photoshop. If you can use Photoshop, even early editions of that software do an adequate job of adjusting the 4 main parameters (resolution, size, compression, color bit depth) that determine ultimate file size, download speed and web "ideality". Aim for graphics file sizes under 100 KB, and you must have resolution set at 72 DPI and a maximum pixel width of 500. Hosting is an ongoing requirement for maintaining a web site. After the domain is owned and the pages are built, AMEs must contract with a hosting company for "publishing" your pages 24/7 on the web. These computers are the machines that "serve" web pages to web surfers. There is wide variation of cost and quality for this vital service. When searching for hosting services, markers of value are the amount of server space, POP accounts, bandwidth, and ping/download speed of the pages. Host accessibility is also critical, both the designer's interface to the server, and the accessibility to relevant customer support. At FlightPhysical.com all AME queries are answered by other, knowledgeable AMEs. We speak your language! Be sure you choose a reputable host if you decide to host elsewhere. FlightPhysical.com already hosts your default (template) web page for free at a basic level of service, and we have several upgrade options listed on our price list page. You have many choices in selecting a hosting company, but FlightPhysical.com terms and service are superior, and all hosting plans are guaranteed and upgradeable/downgradable anytime without penalty. Our basic hosting services are free. Most importantly, we bundle pilot-centric advertising and publicity efforts with all of our hosting services. FlightPhysical.com's free marketing efforts are very specific to pilots and useful to AME practices. If you host elsewhere, be sure to at least link your site to ours to insure that you still take advantage of our pilot popularity and drive relevant pilot visitors to your web site. Publicity is the most neglected but most important consideration for your site. Even $10,000 sites are useless if no one can find them. This is FlightPhysical.com's greatest strength. We successfully market AME sites to a niche market--pilots needing physicals. All major search engines will list us at the top of any pilot or patient query for terms such as "flight" and "physical." There is strength in our collective size and years of experience. See our explanation page to see how we tackle the AME publicity problem. Search Engine queries often return millions of results...if you want to get noticed, you must be among the top three or four sites. A Google search on 10 Apr 2005 yielded 7,580,000 relevant sites, and FlightPhysical.com site was number one on the multi-million output list! Ranking and total number of returns on Google and other search engines changes daily, and we have been at the top for the last 4 years because output order is based on Internet-wide popularity. FlightPhysical.com's daily traffic has grown exponentially over its first 6 years and our collective site serves thousands daily and generates more "hits" than any single AME trying to promote his/her site. From 1999-2006, we have gradually climbed to the top of all Internet search engines. You will increase your site's page rank in search engines when you have popular sites (like FlightPhysical.com) maintain inbound links to your web address. FlightPhysical.com should be used to funnel traffic to your professional AME site regardless of your site's complexity or hosting arrangement. How do I add my own pictures to my site? To add pictures, email us the pictures as attachments. Small, web-ready pictures can be posted on your site for free. Indicate whether you want the image to appear in the upper right hand corner or as a large picture in the middle of your site. If you want the picture in the upper right portion, max pixel width is 150. For detailed layout requirements, you will need to upgrade to a static site, but you can send small custom pictures to replace the "default" graphics on your site, even if you stay at the "free" level of service. Regardless of whether you upgrade or not, your digital image must be prepared for the web, and there is always a compromise between file size and image quality. The image(s) must have reduced color depth--ideally 256 colors, but must be below 24 bit color. Resolution should be no greater than 72 dots per inch for the desired display size. Greater resolution will degrade our server's performance with exaggerated file transfer requirements, and this is wasted graphical information because your pilots, patients and web viewers will only be able to display to their monitor's resolution of 72 DPI. In plain English, un-processed images increase your page's load time, thus slowing down the web viewing experience. Despite imparting this download penalty, you are delivering no extra quality when you try to publish un-optimized images. If your image is not ready for the web (well compressed jpg or gif with low to moderate color depth and total file size less than 200 KB, max pixel width less than 500), we will professionally process any of your digital images for a one time $10 fee. Simply email us what you have and pay online at our payment page. The FAA states: The AME is to conduct all medical examinations at their designated address only. An Examiner is not permitted to conduct examinations at a temporary address and is not permitted to name an alternate Examiner. During an AME's absence from the permanent office, applicants for airman medical certification shall be referred to another Examiner in the area. Current AMEs are authorized a single "primary" directory listing for free and can purchase second listings for $3 per month by sending us email requesting the second listing. This nominal fee helps offset the cost of maintaining this site (we receive no money from the FAA). Additional listings must be added manually and updated by hand as the FAA data changes. How do I update my address and phone numbers? Most of your AME web site content can be updated through our Modification form, but to update your "official" address, fax or primary phone number, you must submit corrections/updates through your Regional Flight Surgeon. We apologize for this inconvenience, but the FAA must maintain control of the central database. We link directly to their list of addresses and phone numbers, then augment that data with unlimited additional (promotional) data that is under direct control of FlightPhysical.com. We will post secondary toll free, cell, pager or back office numbers, but the "official" primary phone number, address and fax number must be updated through the FAA. Through our Modification form, you can add second phone numbers, office hours, education, second degrees or anything else unique to your practice and helpful to your pilots, but primary demographic info must route through the FAA. Don't worry, you will never have to submit more than one change of address. After the FAA gets your change, we will get it automatically from them. If you want a complete second listing, see below. Why is it advantageous to register my domain name through FlightPhysical.com? Cancel, sell, renew or transfer your domain. Modify the domain name servers for your domain. Resolve deputes involving your domain. The benefit of a FlightPhysical.com registration is that the Whois database will publish our name, addresses and phone numbers instead of your personal identifying information. That way, you are protected from spammers, scammers and other intruders. Allowing the AMEs and Internet professionals at FlightPhysical.com to manage your registration is free and this will reduce your headaches during all phases of development. We help you each step of the way, and you have numerous hosting options with FlightPhysical.com. We maintain flexible "pay-as-you-grow" policies. Our services are guaranteed and there are no long term contracts for AMEs. ( You lost me, please explain about the differences between hosting and registering and other parts of building a web presence). What is a domain and why would I want one? A domain is a type of address on the Internet. It is your own part of cyberspace. In practical terms, it is part of the URL (uniform resource locator) between the www and the .com (or .net or .org). 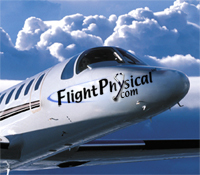 With our website, www.FlightPhysical.com, "FlightPhysical" is our domain. There can only be one account holder for every Web Address. This is why Web Addresses have to be registered by an international authority (the InterNIC). If you are curious, the first step in registering a Web Address is to check to see if the name you want is already registered by someone else. You can check here to check now. Unfortunately, many AMEs are discovering that most common names are already taken by someone else. You don't need your own domain to use our services and benefit from our advertising, but it will enable you to "reserve" a specific Web Address for future development. If you don't get your own domain, you will have a subdirectory (partitioned space) as a part of our collective domain. This can be built into a multi-page, directly accessible web site. If you choose, you can register your own domain and link it to this site. How do we set up the online payment stuff? Online financial transactions have proved safe and efficient. Our AME / pilot relationship is unique in medicine. Seldom do we bill 3rd party (insurance) payers. Flight physicals lend themselves to an automated payment process. Both AMEs and pilots benefit from the paperless efficiency of online payments.